Scuba diving masks can greatly influence the comfort of your dive. If you ever had the pleasure of having to constantly clear your mask or having your mask squeeze your face, you know what I mean. Unfortunately, I can relate because it has happened to me. It's hard to enjoy the underwater sights to the fullest when your mask doesn't fit properly and you are constantly having to fiddle with it. So choosing the type of mask that is right for you and getting the proper fit will go a long way toward making your dive enjoyable. It is a simple piece of equipment but it can ruin your dive faster than you can say "wow". I recently bought a new dive mask because my old one of over 15 years started constantly leaking on me. It is now relegated to a secondary snorkeling mask. For use in emergencies only. If you are interested, I purchased the Atomic mask which I recommend lower down on that page. I couldn't be happier. It has an unbelieveable field of vision and I don't think I could ever go back to my old style. This link will also take you to our free scuba diving mask buyers guide with more information on dive masks. So let's get started on finding the right mask for you. Single pane lens - In this style there is a single lens on the front of the dive mask and lenses on either side of the face. Not that you can really see out the side lenses, but you can pick up movement. This was the style of my old mask and I liked it - until I got my new one! Double pane lens - This style of scuba dive masks has 2 lenses in the front and, like the single pane lens, lenses on either side of the face. So there is a physical separation in the middle of the front lens. Dive Mask No Purge - These are the most common type of masks, whether with a single or double pane lens. This type of dive mask has a plain rubber nose with no opening (see next entry). 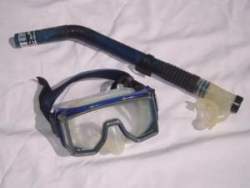 Dive Mask with Purge - These types of masks have a purge valve on the bottom of the nose. This allows a diver to clear the mask by simply exhaling into the mask. I have never tried this type of mask so I can't give you my opinion. Reading on scuba forums, however, two fairly common complaints with this type of mask seem to be problems equalizing and free flowing at depth. The problem with equalizing is related to the the rigid nose and not being able to properly squeeze your nose. Some divers have also reported that the dive mask with purge suddenly starting to leak water in through the purge opening. So they are stuck constantly having to exhale to keep their mask clear. Of course, many people are happy with the dive mask with purge so it's a matter of preference. Just be aware of the possible problems. Full Face Scuba Mask - These are scuba diving masks that covers the whole face of the diver. Water is sealed out and a mouthpiece is built into the mask and allows the diver to breathe. 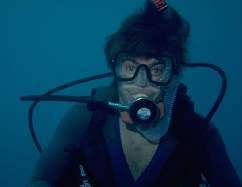 A full face scuba mask is typically only used by professional divers. It is rarely used by recreational divers. I have never seen anyone use a full face scuba mask during my dives. Scuba diving masks come in many different sizes and shapes. It is important to get one that fits you correctly. You will probably have to try on quite a few masks before you find the one that fits you properly. Touch mask to face - Put the mask up to your face and stop when it is barely touching your face. Do not press the mask hard onto your face. Ideally the mask should touch all around your face at the same time. Check skirt - There should be no gaps between the skirt and your skin. Check around your temples and the smile lines between your nose and corners of your mouth since this is the most common area for leaks. If you see big gaps, move on to another mask. Inhale - Sniff in lightly through your nose to to create a vacuum on the mask. The mask should stay in place without any straps or hands holding it in place. If you have to keep on inhaling to keep the mask on, try another mask. Exhale - Exhale through your nose to remove the mask. The most important step to getting the correct fit is to check the skirt as it is barely touching your face. The proper skirt fit will do the most to making sure your mask doesn't leak. Even if you find one that you think is perfect, set it aside. Try on a few more masks and you might just find the "more perfect" fit for your scuba diving mask. First select the style (listed above) that you are most comfortable with and gives you the best field of vision. Next check the skirt around the mask. High quality scuba diving masks will have a silicon skirt around the edge which will give you a more comfortable fit. There are even different grades of silicon. The more expensive models will probably have a higher grade silicon - the skirt will feel softer and more flexible than those on the lower grade scuba diving masks. After you check the fit of the mask (as outlined above) continue on and check the fit of the nose pocket. The nose portion shouldn't be swimming around your nose, nor should it be tight. The nose pocket should not touch your nose. The right fit here will help you in equalizing and purging. The last thing to consider is the strap. Scuba diving masks typically come with a strap made of rubber or silicone. Straps with 2 parallel straps at the back of your head are generally more comfortable than a single strap. You can easily buy a strap to replace the one that comes with your mask. My hair tends to get stuck in the rubber straps so I buy a replacement strap that is padded and soft. Just make sure you'll be able to adjust the strap underwater if need be. Good luck finding the perfect scuba diving masks. Some time spent now will more than pay off in comfortable, leak free dives.